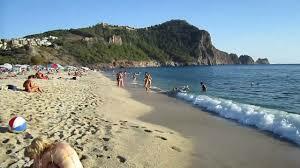 Alanya holidays are popular with tourists who make their way to Turkey every year for their holiday getaway. The lure of the Mediterranean weather and the natural scenic views is spectacular and widely reviewed. Whether you are looking forward to the inviting warm weather in Alanya in October or the Cleopatra beach experience, you are assured of a lovely time. The Cleopatra Beach is one of the two beaches you find in Alanya and it occupies the west side of this tourist destination. The sand you find at the beach is of finer grain than the one you find at the east end. The water is clean and warm and many people enjoy the cascading waves as an additional treat. The boat ride is another feature that people love to add to their list of things to do in Alanya and the journey is about one hour from the city harbour. Along the trail, boat stops are observed up to four times so that tourists can take a dip intermittently. There are a number of caves along the route as people make their way to Cleopatra beach and they can also view the medieval Castle along the pathway. A visit to the black horse restaurant with its disco bar is also commonplace with tourists and they give it a mention on their list of things to do in Alanya. Apart from the sumptuous food and drinks, the music is always enlivening and you will love to take to the dancefloor. The Dim River is one place that features on the list of things to do in Alanya for many tourists. It has its source at the Taurus Mountains which is found at the eastern fringe of Alanya. The pathway to this attraction goes past the ubiquitous hydro -electricity dam as well as the artificial lake created for the power generation facility. The wooded mountains and steep landscape are all attractive to tourists. The skin peel and whole body massage is recommended for your first day here in order to prepare your skin for the sun tan and eliminate the dead skin cells. Assured of the soothing oil of the massage session, you will enjoy the smooth sensation on your skin and feel the freshness. There is a variety of special treatment spas to explore and do not forget to have this experience during your Turkish holidays.